JO's wood boiler - General Discussion - Drive On Wood! JO; I find this very interesting, although at my age I am not prepared to get involved in such a furnace. I built an outside boiler, but when I was in the hospital, I had my wife shut it off and go to our NG furnace. In the meantime the outside boiler froze up solid. I didn’t know if it had broken the tank, although it did break a couple of cast fittings, so I decided at my age and condition, I could afford NG. I certainly was not aware of this design 20 years ago, and even today, I don’t know enough to consider building one. Again, my hat is off to you. It is interesting that you heat your water in “batches” and feed it into the main reservoir. I am trying to get my head around your reservoir. I come up with a 6 ft dia. by 6 ft tall tank. Is that in your basement or do you have it buried outside? Tom, I had to laugh when I read your " dominate the discussion" . You have a clear, fun to read and easy going way of expressing yourself. Please don’t stop. Sorry about your boiler but it’s more important that you got home from hospital in one piece. I actually have two tanks. One is 1200 L (cylindrical). I used only that one with my old boiler and “stove”. The other one is square, 2700 L + 100 L fresh water heatex inside. I mounted valves to be able to run them in series or parallell or shut one off if i choose…They are both in the basement. Takes up no more room than my wifes wardrobe The expansion tank upstairs is more of a pita. It’s convinient however to be able to go down and make a fire when ever you feel like it. There is always (almost) room for some more heat. Don’t know what you mean by “batches”. There is an ongoing cirkulation (as long as exhaust temp thermostat indicates fire) in a bypass to ensure that the bottom of the boiler stays warm to prevent condensation and rust. When water reaches 90 C the thermostat lets some through to the tank. Cold water from the bottom of the tank mixes with hot bypass water and reaches the bottom of the boiler again. Water mantel: Might be my “swenglish”. Just refered to the fact that a boilers fireplace is surrounded by water unike a stove. PS My wife doesn’t collect clothes, but we have every toy and every prom dress from our grand kids. Nice heats practical systems integration. Anyone reading realize he is putting the heat generation down low and heat-to-be-used-centered to the heat uses. This lets him maximize on easy heat RISES ALWAYS. Maximize on thermal siphoning of waters; airs (primary, secondary and space heated) and combustion exhausts. Note some where above that he says his combustion chimney is 8 meters tall, That is ~26 feet high. Mine is 23 feet combustion “fire” to weather keep-out-birds hood-cap. YES, you can down draft turbulent combustion with that kind of draw. Vertical intergration is what makes solid wood heating efficient, practical and simple. Go outside the habitual building with a horizontal lay out makes it complex with then needed pumps for the heats, airs and combustion. Adding in these extra need to be engineered, bought, maintained complexities those system can never be considered to be “efficient”. Having to bundle up . . . to trundle out into the cold, wet, rain/snow will never be as “efficient” as walking over/down in indoor slipper-socks to restoke, poke down and maybe grate-shake. Real secret to making a good effient solid wood burning heating system? Get a SWMBO who will let you put it into the house!! Steve Unruh now out cutting and dry storing 9 months worth of heating season wood. What are the cross section dimensions of your chimney to get that kind of draw? It’s an old brick chimney with 8 channels built by my grandfather in the 30s. The biggest channel is for the boiler. It’s 1/2 X 1 brick (5X10") in the basement but changes to square (6X6") when upstairs channels are added - kitchen woodstove, livingroom fireplace and ventilation channels. They are 6X6" from the start. I’ve read manuals for commercial boilers simular to mine. They suggest 1/2X1 brick and min 7m for natural draft. One last question (maybe) Is there a grate above the restriction? No worries! Go ahead ask. This has been my favorite subject for decades and no one else seems interested to discuss it (not even my wife ) Not until they want boilers, tanks and radiators installed. I’m no plumber but I’ve done several intallations. I never got paid for it. I learned a lot however - I guess that’s payment enough. 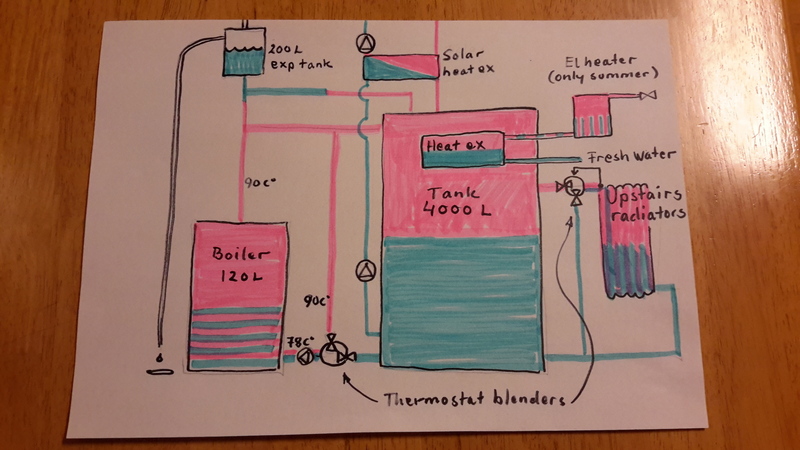 Boilers are unfortunately rapidly replaced with heatpumps these days. People are drilling 200 m deep holes in there gardens or plowing down hoses creating permafrost until Juli and don’t worry about electric supply or a January compressor beakdown at all. We’ll see. No, there is no grate at all. Logs lie down on a ceramic flat floor above the combustion tunnel parallell with the tunnel. There is really no need for that floor. There will be plenty of ash on it. Only reason is to create a void for secondary air plumbing. Floor actually rests on that plumbing. (I think pipes could just as well have been buried in the ash). Air will be somewhat preheated and enters into the restriction between tunnel and floor. Ash down the restriction will all be blown back into the dropbox under the heatex tubes. If not, you can always push it back through the small hatch I was filming. Dropbox has a door on the side for cleaning out. Very interesting topic, sure would like to see a walk-around video of your system, if you do not mind, to help me get a sense of the flows (water, wood and air) and the proportions. I have read all the posts but still having a hard time visualizing. Wow that is impressive! There is a guy in my area that built one but is using forced air into the hopper. I’ll get back to you with a walk-around as soon I get the time. Ok Don! You win. Sketch first. Video later. Have to go to sleep now. Midnight here. Tons of work at work this week. I promised a boiler video. Here it is. Thanks Jan for the video. If a picture is worth a thousand words, your video is worth a million words! A great presentation. The turbolator strips causing turbulence and enabling the heat exchanger to gather more heat was new to me and a very interesting event to keep in mind for future gasification adventures. The combustion tube shots were neat. Thanks for taking the time and posting this informative video of what I would call a bottom lit, downdraft wood furnace. Exactly what I was looking for, I want to build one like this for my shop, thanks for posting!